My girls love to do arts and crafts and honestly if there were more hours in the day we would be getting creative on a daily basis. Unfortunately with school taking up to much time and then the dreaded homework, trying to squeeze in reading and then not forgetting the tutors with their homework most of our days are used up so there isn’t much time to get out all our arts and crafts gear and get making fabulous designs. The weekends are great as we have a little more time to do things so this weekend the girls were super organised and started preparing for Mother’s Day 2017 which is on the 27th of March. It was really appropriate as apparently March is #NationalCraftMonth. 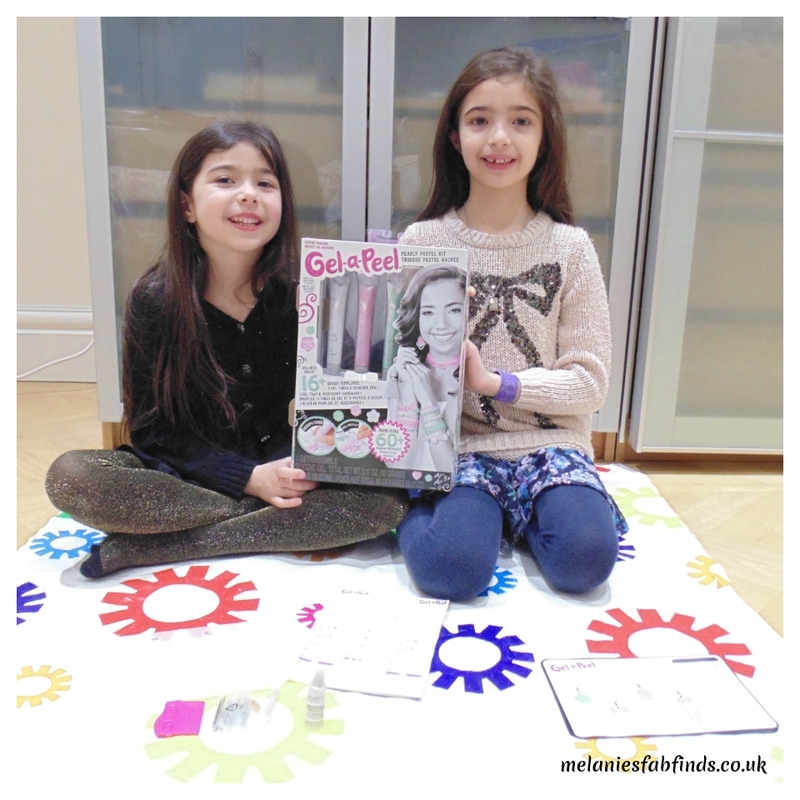 They decided to design Mother’s Day cards using a new product we had been sent to review: Gel-A-Peel. For those like us that have never come across Gel-A-Peel before this is very easy to use and I speak from experience. This was something we were very excited to try and we read all the instructions first to make sure we did it correctly. There isn’t much to it, you simply choose your nozzle (tip) and pipe the gel into shapes and patterns. Inside the box we found 3 pearly pastel gel tubes, 16 design templates, 5 designer tips, and a gel tray. You can also use this in arts and crafts designs it’s a flexible product and isn’t limited to one thing. 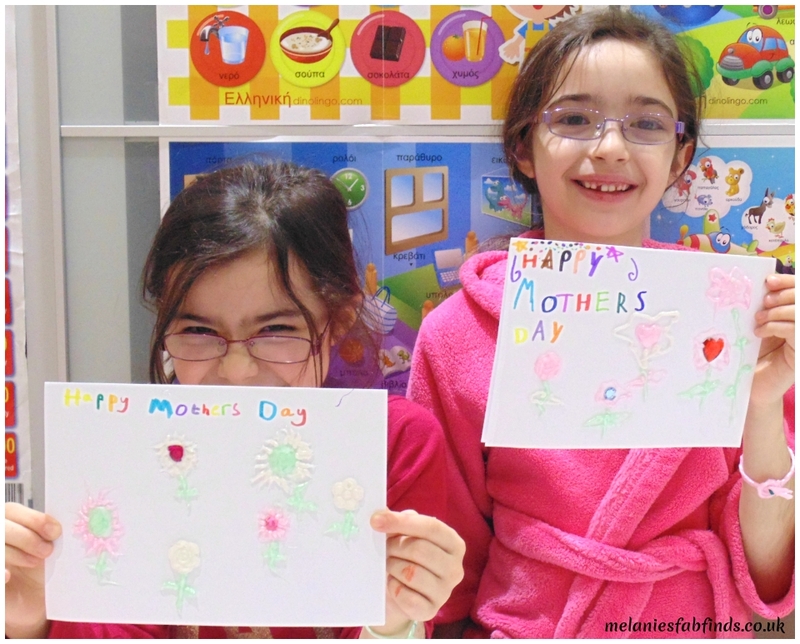 We decided to get creative and make some Mother’s Day cards so firstly we used the tray provided to make some gems and flowers. The gems and other items will take a few hours to dry. We left ours whilst the kiddies were out so about 6 hours. 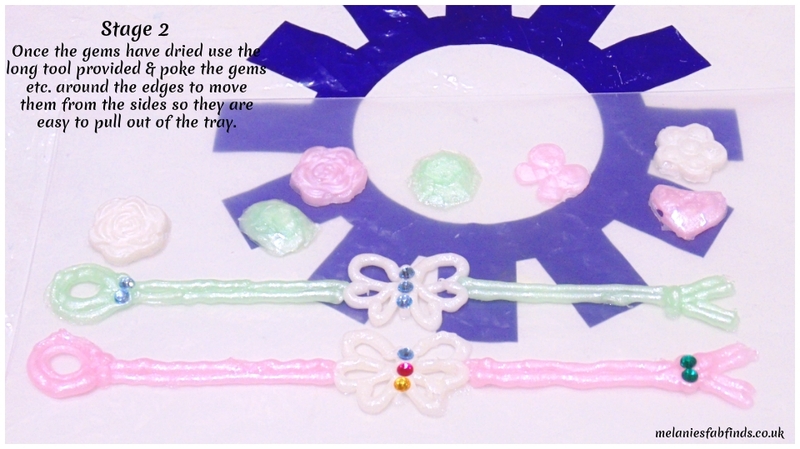 I also thought I we should also make one of the items the kit has been designed for so we made some bracelets using one of the templates provided. We added in some crystals (these did not come with the pack) as we thought they would look great against the pearl colour of the bracelets. The crystals were attached whilst the gel was still wet. Then we started on our card designs. Didn’t they do a fabulous job! 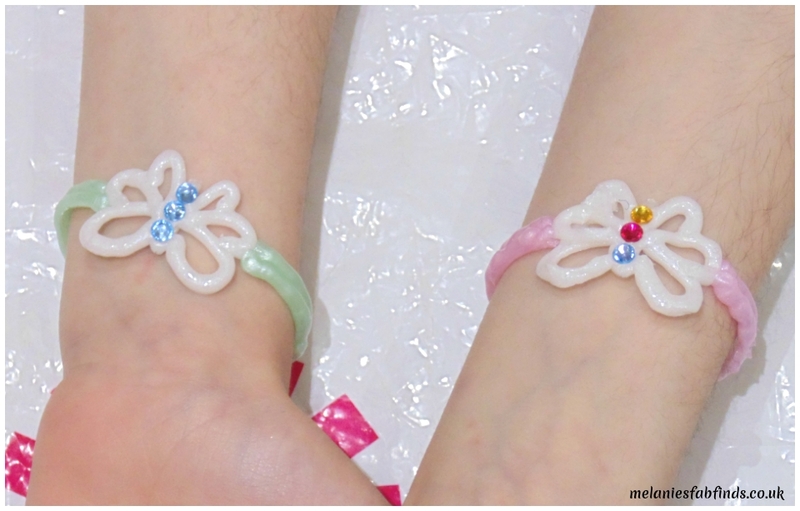 The girls also loved their bracelets. Don’t they look pretty. They felt very soft too and the girls liked stroking them. My girls plan to make some more bracelets for their friends. We thought that this was a fab arts and crafts set and that you guys would love one too so we are holding a competition for one lucky reader to win a Pearly Pastel Kit like the one shown in this review. Do you have Fairies in Your Garden? I don’t blame them it is great fun. I love arts and crafts too. I must admit I had a go with this too it was fun! No problem these are super fun for little ones. It sure is and really good fun. You should have seen the concentration on their faces. They did do a fab job didn’t they and they had a great time too which is the most important part. Lol, these things seem to sneak up on me all the time. No t wasn’t too messy which I was very pleased about. It’s great is it is very versatile! Awww, this looks like so much fun! Will tell my cousin about this, she may love it! I’m sure she will I did and so did my little ones. What an awesome craft idea! I would have loved these as a little girl. I know they are brilliant aren’t they!!!! She is a little young for this but I’m sure she’d love one when she is older. What a great activity to keep little hands busy and creative 🙂 Looks like such fun! Wow, this is really looks so much fun, My niece would enjoy this for sure. It is really good fun and I was pleased at how well all worked together too. This looks great! I would have loved this when I was younger. I quite liked getting to have a go myself with the girls. I forgot how much I loved getting crafty. This looks like so much for the kids. I think my girls would love it! I am sure the would it’s a lovely creative toy for little ones. 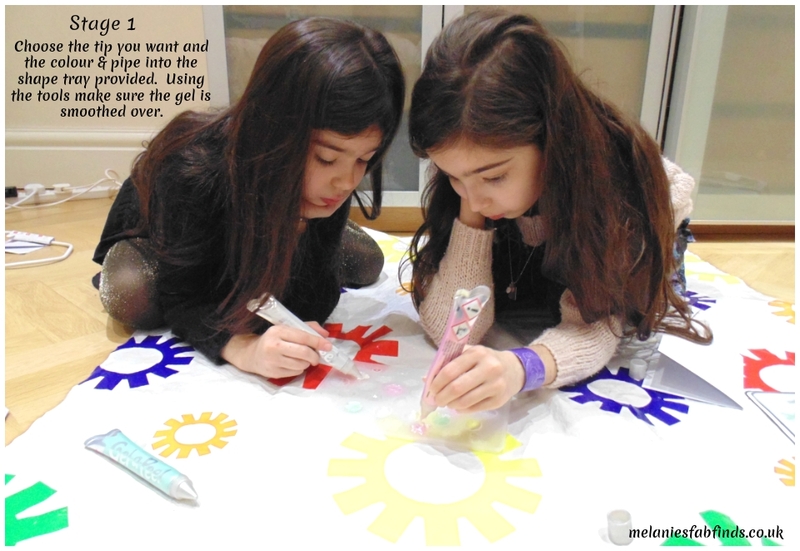 It is a great idea for an Easter present and will keep little ones occupied for ages. Your girls are so creative. Those bracelets are a great idea. They look great don’t they, we really loved this gel it is fantastic! what a fun activity for the girls, getting this for my niece! I like to be creative. 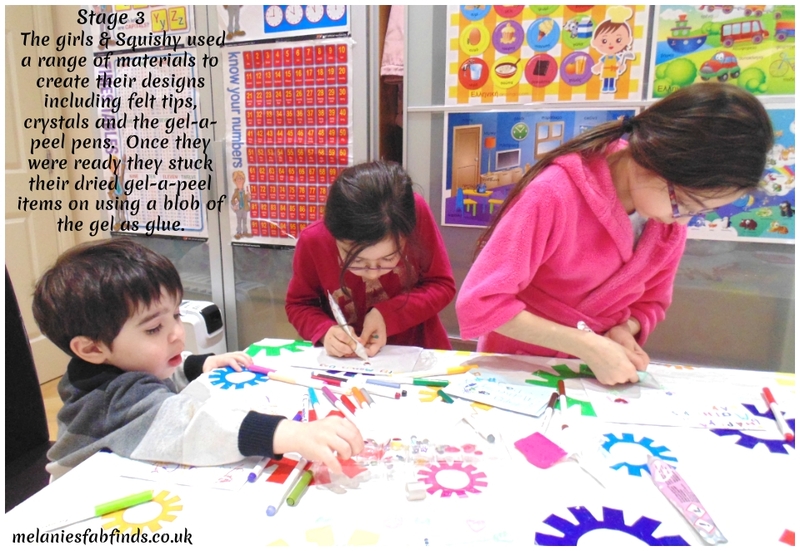 These are great to help children have fun with art sand crafts and be inventive with it too. Totally love gel a peal and am so happy that they are bringing out new ones, like this pearly and the sparkly. Hope they have many more to come. This looks like so much fun! Fab giveaway too. It really is a great idea and fun to do. This looks like great fun my little one would love it.